A whole lot of drama goin’ on! I like the work of Linda Warren. It’s like spending time with old friends. Usually these friends have a whole lot more drama than mine do, but that’s why it’s fun to read about them. 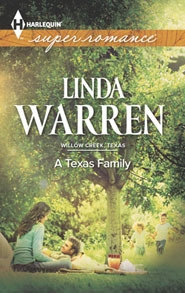 A Texas Family is a good read. The characters are interesting and I thought about them long after the book closed. I couldn’t stay up to finish the book and they were with me as I fell asleep. That’s a real feat for an author–to hold my attention even when the book is closed. There were a few things about this book that ripped me out of the story. At one point the hero and heroine are in the bedroom and the descriptions–while staying with the sweeter side of spicy–didn’t make sense, so I had to read them a couple of times. Another thing that pulled me out of the story was when the characters would be doing two things at one time, ie “pulling the phone out, he made a call”. I couldn’t get past that for a little bit. Granted, these are small things in the story and shouldn’t inhibit all readers. I think I was the exception. Another thing that got to me with this story, but isn’t a bad thing, were the characters. The lack of trust in this story is astounding. I don’t know how someone didn’t clobber anyone else before it was done. I got emotionally involved with both Carson and Jena and for their collective sakes, I wanted to bop someone on the head. The baddie was bad, and a little nonredeemable. But that made the story interesting. I do like how Ms Warren wrote the ending. Good job! This isn’t the spiciest book on the spicy scale, but it packs a punch. If you want characters with zip, a story line with plenty of twists and turns, and a great ending, then this might be the book for you.